Pharmaceutical Analysis book from C.H.I.P.S. 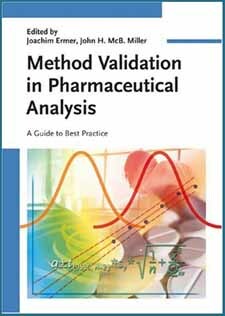 Method Validation in Pharmaceutical Analysis is a practical reference for analytical chemists, the pharmaceutical industry, pharmaceutists, QA officers, and public authorities. The authors, with their first-hand knowledge of both the industry and regulating bodies, interpret in detail existing regulations, while discussing the appropriate calculations, parameters and tests. The book thus allows readers to comply with the regulations as well as with the industry demands for speed and low costs.